Syllabus of the Online Course (Subject): Organisation for Economic Cooperation and Development (OECD). Description of the Online Course: OECD (Organisation for Economic Cooperation and Development). 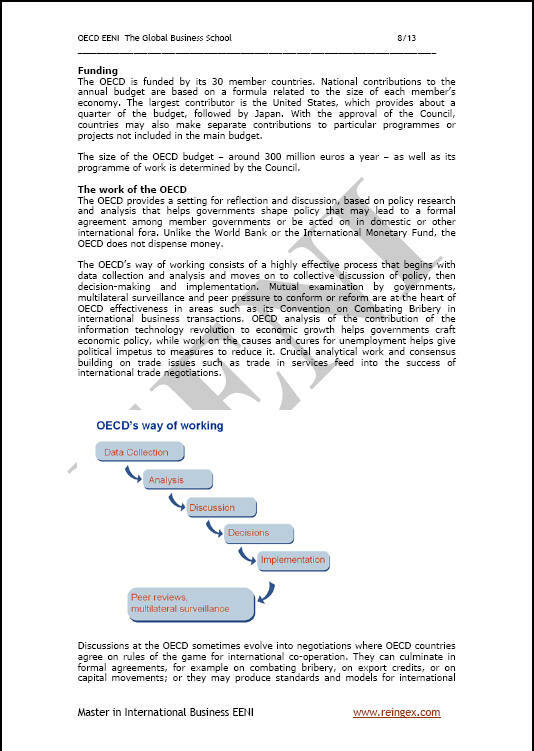 The Organisation for Economic Cooperation and Development (OECD) helps governments to guarantee the responsiveness of key economic areas (International trade in goods and services, foreign direct investment, Globalisation) monitoring their activities, helping governments to adopt strategic policies. The OECD Economic Outlook analyses the major trends in the economy and foreign trade in products and services of the OECD member economies. The Organisation for Economic Cooperation and Development member countries are Australia, Austria, Belgium, Canada, Chile, the Czech Republic, Denmark, Estonia, Finland, France, Germany, Greece, Hungary, Iceland, Ireland, Italy, Israel, Japan, Korea, Luxembourg, Mexico, the Netherlands, New Zealand, Norway, Poland, Portugal, Slovak Republic, Slovenia, Spain, Sweden, Switzerland, Turkey, the United Kingdom, and the United States.